This idea started back in October, when my friend Savannah (also our wedding photographer!) asked me if I would be interested in helping to style a shoot she was planning for this winter. After talking to her about her ideas and goals for the shoot I came up with the theme of a "Dead Garden Party". An outdoor garden party held in the dead of winter. Contrast bright, beautiful models with dewy, flushed makeup against a stark winter background. A pretty, vintage tablescape with tortured-looking centerpieces made of dried flowers and dead sticks. Like the moment a crocus flower blooms through a blanket of snow, announcing the arrival of spring. TIP: Writing a concept statement is a great idea if you are in the beginning stages of planning a special party or wedding! Having a singular, specific vision or "story" for your event's look will help to guide you in making cohesive decor selections. Selecting the decor for our shoot was relatively easy! Both Savannah and I love collecting vintage housewares. She had a great collection of depression-era china from her Great Grandmother and I had recently purchased two French wingback chairs from the 1960's on Craigslist. We used these things as a starting point for our color scheme of pale pinks, golds, creams, beiges and light greens. I hand lettered place cards for our two table settings, choosing the names Eloise and Maeve to fit our vintage-inspired shoot. The antique lace table cloth is another heirloom of Savannah's family, passed down from her great grandmother. I had never seen it in person, so I brought two options for tablecloths to layer under it hoping one would be close enough in color. I ended up layering both my ivory table cloth (ok, it was actually a bed sheet!) and my brighter white table cloth (an actual table cloth!) under the beige lace. It's a little counterintuitive to mix shades of white, cream and beige but it ended up working perfectly! The bright white makes the beige lace pop in a way that it wouldn't with a matching ivory or beige cloth underneath. Our shoot's theme could easily be adapted to a winter bridal shower, or even a wedding! Something about the dried florals and icy pastels seems so sweet and romantic to me. What do you think? A special thank you to Kyle Soskin and Anthony Storck (not pictured) for helping us to set up for the shoot! Now head over to Savannah's blog to see the rest of the photos! If you haven't read the story of Rachel & Matt's engagement yet, you can find her first "With This Ring" post with all the sweet details and photos, here! After the excitement of our engagement had settled, Matt and I began to discuss what we envisioned for our wedding celebration. It was simple for us to decide upon a relative time frame that would work best for us as a couple. On track to begin my Ph.D. immediately following my Masters, I made a general estimate as to where I would be in my education timeline in the coming years. We selected our year based upon that prediction, planning for a time that would not involve a thesis or dissertation of any sort. In addition, we knew in advance that we would be paying for the wedding ourselves, meaning that we also needed time to save enough funds. With a starting point defined, we moved on to establishing a season, which in my mind, really initiated our wedding planning (yay!). My biggest fear in the whole process was that the day would stereotypically become ‘all about the bride’ and only represent what I wanted. I never understood why weddings have always been framed in that way. Isn’t a marriage a union of two people, after all? Shouldn’t the celebration of a couple then be what both the bride and groom want? I wanted to ensure that ours reflected Matt and I both as individuals, and as a couple. He is often just as interested in talking about our wedding as I am, allowing us to decide together what we want the day to entail. Fortunately for our season discussion, we both vocalized that we wanted a winter event. We both love the colder temperatures and weather, as well as the idea of how stunning our pictures would be if it actually snowed on our wedding day! More specifically, we wanted to capture the feeling you experience when you just come in from the cold. The warmth, the coziness, the glow. To us, there is nothing better! Ultimately, we decided that January of 2017 would be our best window. I suppose we can begin our countdown as two years (ish) to go! Next on our agenda was settling on a wedding color. I’ll admit we waited a few weeks to continue our conversation (anyone who knows us personally can attest to our procrastination efforts). This time around, we did not agree on the first try. We each suggested colors that the other would not approve until it seemed we had exhausted the color wheel. Slightly frustrated, I began searching for winter weddings online to see if anything struck our fancy. Perhaps a different shade was all we needed to find something we both loved. Sure enough, I came across bridesmaid dresses in a lovely shade of emerald (Pantone’s 2013 Color of the Year for all you design-lovers out there!). We both were convinced right then and there that emerald, with gold accents, would be our theme! Interestingly enough, weeks later we realized the significance of these tones; green and gold were the class colors of our high school where we met for the first time. It doesn’t get more meaningful than that! Once we were in agreement, I browsed Pinterest for inspiration. Below is the concept board that I put together of our vision. I absolutely cannot wait to share some of our more developed ideas with you all! Be sure to follow Rachel on Pinterest! Why? Because she might be even more of a Pinterest addict than I am. I repin almost everything she posts! This girl has excellent taste. There may still be two weeks until Winter's official start, but we've already experienced a couple of snow storms here in Pennsylvania! Plus, now that we are in December, all I can think about is CHRISTMAS! So today I'm introducing my Seasonal Color Scheme, the first post in my new Winter Style series! I'll be sharing decorating and DIY tips all season long, so stay tuned! I'm following the same philosophy as my Fall color scheme by avoiding the typical red and green and instead doing tonal variations that will last me all season long. When I started thinking about color schemes for this winter, the one image I couldn't get out of my mind was the deep bluish green of fresh spruce needles. I made this color my starting point and went from there, pulling photo inspiration and colors that seemed fresh yet cozy. I originally marked the photo of the sofa because of the color of the Hermes blanket, but I thought way the green Pellegrino bottles pop off of the warm caramel tones in the brick wall was so striking that I made that my fifth color! It's bright, fresh and a little unexpected. Have you started your winter/holiday decorating yet? Share your photos on the Stevie Storck Design Co. Facebook page with the hashtag #winterstyle! I would love to see the colors you are working with this year! If you only do one thing to decorate for the seasons, make it a wreath! Wreaths are a beautiful way to add a dose of festive spirit to your home's exterior. My love of wreaths is well documented; last Winter I rounded up my wreath picks in this post, and the Spring before, I experimented with making the DIY yarn wreaths that were all over Pinterest back then. I've always loved the look of grapevine and silk flower wreaths, but I thought they would be much harder as a DIY project. It turns out, they are not hard at all! I used my Seasonal Color Scheme as inspiration during my shopping trip at Joann's. One thing I love about seeing Christmas decorations in stores in August is that now we are only a couple of weeks into fall and Joann's stock of Fall florals and decor are all 50% off! I was glad that I went in with a color scheme in mind, because there were so many great options in the clearance bins that it was hard to choose! At the end of this post, you'll find a list of the materials I used, with links to what I could find online just in case you want to replicate my choices. Since this was my first time making this type of wreath, I definitely had to do a bit of trial and error along the way. Read on to see my 7 tips for DIY wreath making. 1. For a foolproof color scheme, use my 3 + 1 rule : 3 colors plus 1 shade. For example, my main 3 colors are red, white and green, but to add depth to the arrangement I added a darker shade of red --burgundy. This scheme would work just as well if I would have used a darker shade of green as plus one or even a pretty champagne color to act as a darker shade of white. The plus one shade doesn't have to be darker either. Pink would also be a great plus one for this scheme, as long as your are using a shade of pink with the same undertones as the red color you are using. Using this formula will give you a balanced color scheme every time, which is the perfect jumping off point for any crafting or decorating project! 2. Vary textures when choosing silk flowers. You'll want to have a nice mix of stems (the word for single flower blossoms grouped together) and bushes (fuller flowers like hydrangeas or bunches of leafy foliage). You also want to vary flower sizes to add some visual interest. For my wreath, I used large hydrangeas, medium sized chrysanthemums and small red ranunculus. 3. Cut silk flower bouquets into individual blooms. This makes creating a balanced arrangement MUCH easier, since you won't have large clumps of the same type of flower in one place. This seems like an obvious thing to do in hindsight, but I didn't start out doing this when I made my wreath. Save yourself from having to undo all of your wiring and start over like I did! I recommend cutting the wire stems about 2"-3" away from the bloom if you are using a grapevine wreath. If you are planning to wrap the stems around a wire wreath, you'll want to cut them a bit longer. 4. You don't have to cover the entire wreath with flowers. This was another thing that I found out through trial and error. For my first arrangement, I had the burgundy leaves wrapped all the way around the wreath and something just didn't look right about it. If you are using a grapevine wreath, don't be afraid to let a portion of the vines show. My arrangement is about 75% florals, 25% grapevine wreath, but I've seen beautiful wreaths that use the opposite ratio-- 75% grapevine wreath, 25% florals. Pick a focal point and work your way out from there, or create multiple clusters of flowers and arrange them symmetrically or asymmetrically around your wreath form. The options are endless, so just play around with it! 5. Plan ahead. Definitely take the time to layout your arrangement BEFORE you start wiring things down. You may be tempted to just wing it, but believe me; undoing twisted floral wire in grapevine is a pain. If you are layering flowers, you also want to consider the order that you are going to wire your blooms down in. Which pieces do you want to be more in the background? Which pieces do you want to overlap, and which pieces do you want to be front and center? 6. Take a picture. If you are anything like me, you will probably get to a point (about 3/4 of the way through this project) where you cannot decide if you love or hate the way your wreath is looking. Do NOT start unwiring or changing anything until you pause for a moment to do this. Taking a picture is great because it takes your project from life size to miniature. You will get to see your wreath design more as a whole, instead of as a sum of its parts. For me, it is much easier to tell if a composition is balanced from a photo than it is in real life. The other benefit of taking a picture is that you'll get to see your wreath from a vertical position like it will be hanging instead of a horizontal position like it is on your work table, without having to worry about parts that aren't yet secured with wire yet falling off in the process. 7. Know when to stop. I always struggle with this when I am doing any type of creative project. I'm also a perfectionist and pretty intense about my crafting, so hopefully you don't have this problem! Anyway, I remember telling Anthony the night I was making this, "Ok, I'm either done with this wreath OR I am going to keep tweaking it for the next 2 hours. I can't decide." This is the point where I take a break. For 5 minutes, I force myself not to look at whatever I'm working on. When the 5 minutes is up, I am able to look at my project with fresh eyes and 9 times out of 10 it looks so much better than what I remembered. This works similar to the take a picture thing as a way to make yourself see your creation as a whole instead of just focusing on the odd berry that will not lay right or the leaf that keeps getting crumpled. There you have it! My 7 tips for making your own wreath. Have you ever tried a hand at wreath making? I'd love to hear your tips in the comments below! Sign up with your email address to receive new blog posts, straight to your inbox. Thanks for subscribing! I'm so glad you're here. Connect with my on Twitter or Instagram @steviestorck! I would love to hear from you! 1 Faux Stem of something I don't know the name of.... comment if you can identify it! It's the grayish stems, I only have a few in there. Anyone who's active on social media will probably agree that over the last several years, Fall has developed a cult-like following. I see Fall-inspired pins on my Pinterest feed all year long, but as soon as August hits, it seems like my Facebook feed is chock full of excitement for the impending season. If "Fall" has become a cult, it's obvious that the "God" being worshipped is the ubiquitous Pumpkin Spice Latte. Seriously, type #pumpkinspicelatte (or even #psl) into the Twitter search bar and you will find enough references to keep your scrolling down for the rest of your natural born life. Call me a follower, but fall is definitely my favorite season! While I do enjoy a good pumpkin spice latte from time to time, I think this season is more sentimental for me because its when Anthony and I celebrate both our dating and marriage anniversaries. Now when I think of fall, I get a warm fuzzy feeling thinking about the days and weeks leading up to our wedding last year. 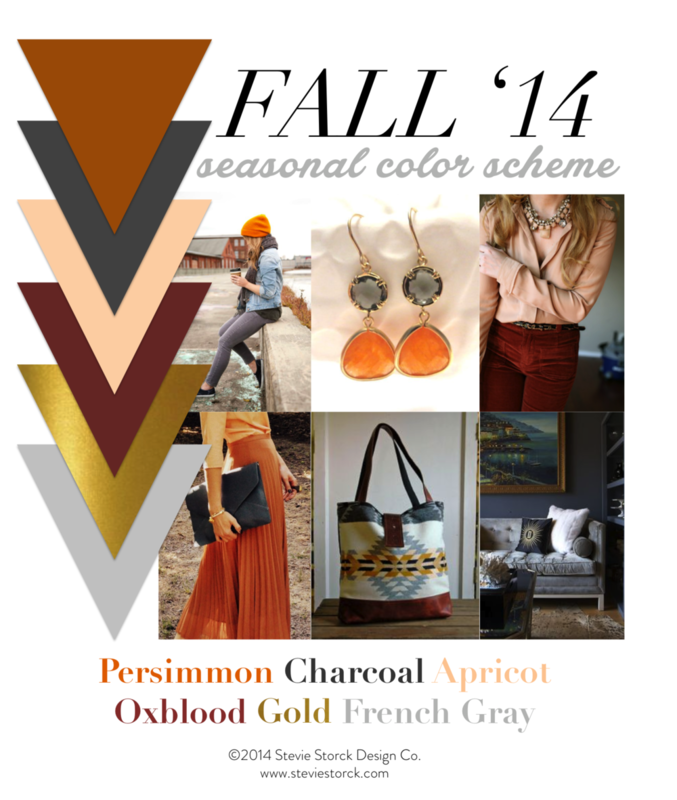 In celebration of the change in seasons, I've put together a little fall color inspiration for you. When it comes to seasonal decorating, I tend to go for muted variations of the "typical" shades associated with different months or holidays. Especially for Fall, I like to do something different than typical orange and black so I can make my decorations last all the way through to Thanksgiving. This year, I'm planning to go with a rich, moody color, semi-70's inspired scheme of Persimmon, Charcoal, Apricot, Oxblood/Burgundy, Gold and French Gray. I'll be posting throughout the next couple of weeks how I use this color scheme for my own fall decorating. I hope this gives you a little inspiration as you get started on yours!